There was a large crowd at Wollaton Road, Cemetery in Beeston, when William Hancox, the son of Charles and Eliza Hancox of 6 William Street, Beeston, was given a full Military Funeral. Representatives included there were officers and boys of the Boys Brigade and members of the Beeston Old Boys. William Hancox was born in 1894 in Beeston, the third son of what was to become a family of at least twelve born to Charles and Eliza. In 1901, the family was living at 30 Chapel Street, Beeston and Charles was working as a cycle mudguard maker, presumably for the Humber Cycle Company in Beeston. Both Charles and Eliza had been born in Birmingham, where their first children were born, before moving to Beeston about 1889 where, at first, he worked as a forgeman. 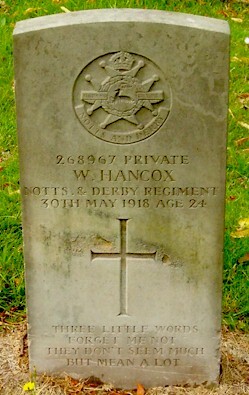 Private Hancox was the 38th member of the Beeston Old Boys Association to lose his life during the Great War. He was serving with the 5th Reserve Battalion Sherwood Foresters which, as well as supplying drafts to replace casualties in France, had the job of guarding a stretch of the East Coast against any invasion by the enemy.